Learning how to groom a dog varies a bit with each dog breed. Fortunately pet grooming for Weimaraners is easy, because they are low maintenance dogs! Pet grooming at home is more than just brushing your dog. Dog grooming also includes bathing your dog, hair clipping and cutting, trimming dog nails, brushing dogs teeth, cleaning dog ears and dog eye care. 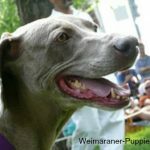 When you brush and comb your Weimaraner regularly, you will eliminate a lot of loose hair and get rid of much of the dirt and mud that your Weimaraner picks up outside. 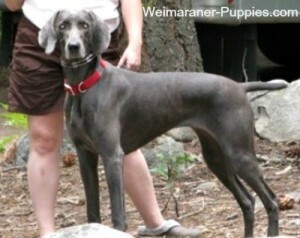 And grooming dogs with short hair, like Weimaraners, is easy! 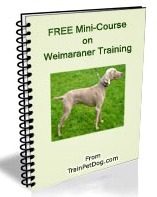 All you need to get started are some simple pet grooming products, a good book about Weimaraners and a little time. and they are beautiful when properly groomed! Brushing your dog’s teeth is very important for his health. 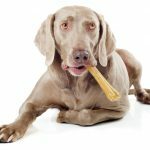 Taking just a minute or two each day to care for your dog’s teeth and gums, will prevent a number of diseases that can affect your Weimaraner dog. Giving your dog dental dog treats and dental dog toys will help keep your dog’s teeth free from plaque buildup. The dental chew shown in the photo to the left could keep your dog occupied for quite a while, while it cleans his teeth. He’ll love one, too! When you clean your dog’s ears regularly, you can prevent a number of ear problems. Ear cleaning will help prevent ear issues like ear mites, wax buildup and dog ear infections. Trimming dog nails is not hard, but there is a right way and a wrong way to do it. One of the secrets of making this easy is to make sure that you have quality tools to do the job. 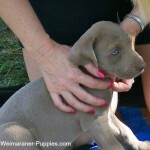 Weimaraners are easy care dogs who require very little maintenance. However, one of the things that you must do routinely, is brush them. Brushing your dog is not hard. And it’s a great time for bonding with your pet. 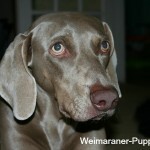 Weimaraner dogs can have canine allergies and they often do have dry rough skin. It’s hard to say if their skin is irritated because of hunting and running through woods and fields–or just because they are sensitive. If your dog has any of the signs of skin sensitivity, you should consider using a gentle and soothing hypoallergenic dog shampoo. 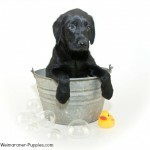 Getting your new puppy ready for grooming starts the minute you bring her home. 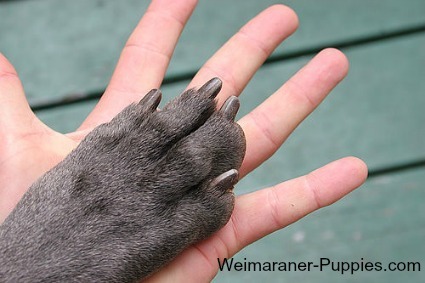 Handle your puppy every day to bond with her and get her used to being touched and handled. This will make grooming natural and easy when she gets older. Knowing how to groom a dog and care for his coat, ears, nails, and teeth will contribute to the overall well-being of your pet. By grooming regularly you will be in a better position to notice any changes in your dogs’ body. For example, a lump that wasn’t there last time you looked, or anything that might be a sign of illness or injury. Grooming doesn’t get much easier than it does with a short haired Weimaraner. This aristocratic dog has a short, smooth, and sleek coat, which sheds minimally. Grooming your dog is an excellent bonding opportunity for the two of you. Knowing how to groom a dog can save you time and money. 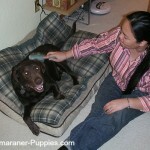 Knowing how to groom a dog, especially when she’s a Weimaraner, is really easy!